Every business faces the existential threat of competitors producing cheaper copies. Even patent filings, market dominance and financial resources can't shield them from copycats. So what can we do--and, what can we learn from companies that have endured and even prospered for centuries despite copycat competition? In a book of narrative history and practical strategy, IMD professor of management and innovation Howard Yu shows that succeeding in today's marketplace is no longer just a matter of mastering copycat tactics, companies also need to leap across knowledge disciplines, and to reimagine how a product is made or a service is delivered. This proven tactic can protect a company from being overtaken by new (and often foreign) copycat competitors. Using riveting case studies of successful leaps and tragic falls, Yu illustrates five principles to success that span a wide range of industries, countries, and eras. Learn about how P&G in the 19th century made the leap from handcrafted soaps and candles to mass production of its signature brand Ivory, leaped into the new fields of consumer psychology and advertising, then leaped again, at the risk of cannibalizing its core product, into synthetic detergents and won with Tide in 1946. Learn about how Novartis and other pharma pioneers stayed ahead by making leaps from chemistry to microbiology to genomics in drug discovery; and how forward-thinking companies, including China's largest social media app--WeChat, Tokyo-based Internet service provider Recruit Holdings, and Illinois-headquartered John Deere are leaping ahead by leveraging the emergence of ubiquitous connectivity, the inexorable rise of intelligent machines, and the rising importance of managerial creativity. Outlasting competition is difficult; doing so over decades or a century is nearly impossible--unless one leaps. 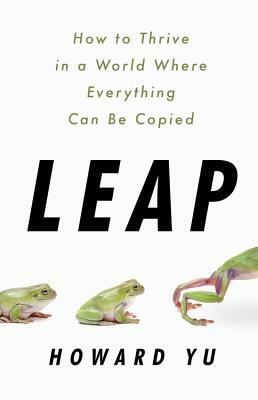 Ultimately, Leap is a manifesto for how pioneering companies can endure and prosper in a world of constant change and inevitable copycats. Howard Yu is the LEGO professor of management and innovation at IMD business school in Switzerland, and director of the Advanced Management Program (AMP), a three-week executive course. Yu was selected by Poets&Quants in 2015 as one of "The World's Top 40 Business Professors Under 40," and in 2018, he appeared on the Thinkers50 Radar list of thirty management thinkers "most likely to shape the future of how organizations are managed and led." Yu received his doctoral degree from Harvard Business School.